A graph of rising conversion rate through Marketing and Sales alignment. Marketing and Sales Alignment is critical key to success. Over the years I have consulted with many companies on lead generation, demand generation, and campaigns to improve conversions. The number one reason organizations fail is because of miss-aligned marketing and sales teams. Even though they know marketing and sales alignment is critical -since the work of one leads to work for the other. Still many companies complain and miss the boat on optimal performance. Mainly because of a division between their marketing and sales teams. Therefore it’s essential that organizations work toward bridging marketing and sales. These two forces must work together to maximize the conversion rate of your marketing campaigns. Without it your leads can be dead on arrive. By bridging the marketing and sales alignment divide you will increase the ROI. Improve the performance of campaigns budgets in both functional areas. 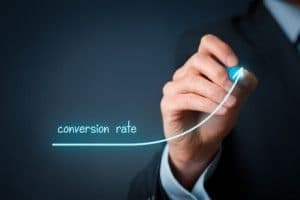 But most important your business will accelerate conversion and grow. The knife is sharp on both sides. All too often, one side or the other develops strategies and processes without the involvement of the other team. Each side places blame on the other when conversions doesn’t take place and ROI falls short of expectations. When both marketing and sales collaborate on strategy and tactics, expectations are clear and everyone understands how each contribute to generating more sales. In addition, to mutually establishing strategies and tactics, it’s essential that both teams collaborate on defining lead classification, grading, or scoring criteria. Key members of both teams should contribute to the conversation as to what constitutes an adequate sales-ready or sales-accepted lead for a particular campaign and can be especially important in complex channel programs. Marketing needs to define the criteria for not-yet-ready-for-sales prospects. This is often neglected and is critical to marketing and sales alignment. Without this definition, leads often get turned over too early. As a result, over time they will be dead on arrival. The key is to establish clarity around your lead nurture efforts before passing to sales for conversion. Visibility into the entire lead generation & sales pipeline is critical. tracking, measurement, and reporting should exist all along the pipeline. On an ongoing basis, both teams should assess how leads are measuring up against the current definitions. Adjustments should be made when appropriate. Occasionally leads will be passed to sales that will not prove to be as qualified as originally thought. Returning these leads to marketing for further re-qualification is important for a couple of reasons. First, further nurturing can occur when appropriate to continue to develop the relationship with the “returned” lead. Secondly, these leads can provide useful insight into areas of the lead development/qualification/classification process where adjustments may need to be made to improve the lead development/qualification process. A “closed-loop” component of the process can also prove valuable to maximize the flow of deals through the pipeline. Occasionally, leads that are ready-for-sales will not receive the follow up necessary for conversion. This can occur for a variety of reasons. The important thing is that you set up a closed-loop step to catch most of the “leakage”. You can address leakage by implementing an extra touch to make sure that all leads are followed up on. This can be as simple as a “customer service” call placed to every lead passed to sales after a preset time (often 2-3 weeks). When leakage has occurred, it is usually easy to get the lead back in the pipeline before the opportunity is gone. Plus, you have created accountability. Another important component in alignment is the handoff from marketing to sales. Do NOT rely on automated systems. This must be handled by a human preferably by a leader or manager who will help ensure accountability. If not often in B2B sales the lack of direct hand off will result in leads not being followed up on in a timely manner or at all. Consider this example we have seen recently. Two regional divisions in the same company received leads from our efforts. In one region the regional manager reads all leads and then comments on something about the lead. For example; the target company, the possible method for follow up, and most importantly the manager requests feedback on the effort to connect and success by the end of the week. In the other region the manager set up an automated process of assigning leads and just forwarded them on. The results 8x the number of leads to converted to opportunities, 3X the ROI 4x the forecasted revenue than the other region. By ensuring that the marketing and sales forces are on the same page with everything from strategy creation, lead definition, and tactic implementation you’ll increase conversions and sales. Not to mention accountability among your sales and marketing team but also revenue growth as your marketing and sales efforts become more targeted and efficient. So how would you consider your Sales and Marketing alignment? What stories and experience do you have relative to sales and marketing alignment and conversion. Support the discussion by adding your insight, expertise as comments below. For more information on how to align your sales and marketing teams for success check us at www.responsepoint.com or visit our blog where this was originally posted. Contact us to request your free consulting session to help you improve Marketing and Sales Alignment.